The Milwaukee Brewers head to Dodger Stadium on Friday to take on the Los Angeles Dodgers. The probable pitchers are Zach Davies for the Brewers and Julio Urias for the Dodgers. The opening line for this game has Milwaukee at +153 and Los Angeles at -163. The over/under is 7.5. The Brewers have a 34-28-4 over/under mark and a 31-35-0 run line record, meaning they cover 47% of the time. The Dodgers are 28-38-0 against the run line and have a 32-29-5 over/under record. They cover the spread 42% of the time. The Brewers head into this game with a 30-36 record, and they are 11-19 on the road. Starting pitcher Zach Davies has a 5-3 record with an ERA of 3.88 and a WHIP of 1.18. He has 50 strikeouts during his 62.2 innings pitched and he has given up 55 hits so far this year. He has surrendered 7.9 hits per 9 innings and he has a FIP of 4.21. The bullpen this season has an earned run average of 4.25 and they have allowed 228 base hits on the year. Teams are hitting .260 against the pen while they've been struck out 207 times and walked 96 times this year. As a unit, Milwaukee has given up 9.32 base hits per nine innings while striking out 7.45 hitters per nine. They are 24th in the Majors in team earned run average at 4.57. The Brewers pitchers have collectively given up 608 base hits and 298 earned runs. They have allowed 86 home runs this season and they allow 1.3 homers per nine innings as a staff. Milwaukee as a pitching staff has walked 229 batters and struck out 486. They walk 3.5 men per 9 innings while striking out 7.4 per 9. They have a team WHIP of 1.43 and their FIP as a unit is 4.70. As a team, Milwaukee is hitting .244, good for 19th in the league while putting together a .231 average on the road. The Brewers have a .393 team slugging percentage and an OBP of .325 which is good for 10th in the league. They rank 25th in baseball with 7.97 hits per contest. Ryan Braun comes into this game hitting .307 and his on-base percentage is at .367. He has 63 hits this season along with 26 runs scored and 36 runs batted in. He's struck out 35 times and has walked 20 times. Jonathan Lucroy is hitting .311 and he has an on-base percentage of .368. He has totaled 69 hits so far while scoring 33 runs and he's driven in 31. He has walked 21 times and has struck out 44 times. The Brewers have 526 hits, including 103 doubles and 69 home runs. They've stolen 56 bases while they've been thrown out stealing 23 times. Milwaukee has walked 259 times this season and they've struck out 620 times as a unit. They've left 454 men on base and have a team OPS of .718. They score 4.05 runs per contest and have scored a total of 267 runs so far this year. Los Angeles comes into this game with a 17-14 home mark and a 35-32 overall record. With an ERA of 5.82, Julio Urias has a 0-2 record and a 1.59 WHIP. He has 21 strikeouts over the 17 innings he's pitched during which he has given up 20 hits. He has allowed 10.6 hits per nine innings and his FIP stands at 4.96. So far this season the bullpen has an earned run average of 3.01 and they have given up 143 base hits on the year. Teams are hitting .193 against the Dodgers bullpen while being struck out 199 times and walking 71 times this season. As a team, Los Angeles has allowed 9.17 hits per nine innings while striking out 7.41 batters per nine. They are 22nd in the league in team earned run average at 4.47. The Dodgers pitchers as a team have surrendered 472 base knocks and 222 earned runs so far this season. They have given up 60 home runs this year and they give up 0.9 home runs per nine innings as a staff. Los Angeles as a staff has walked 179 hitters and struck out 618. They give up a walk 2.7 times per 9 innings while they strike out 9.3 per 9. Their team WHIP is 1.08 while their FIP as a staff is 3.39. As a team, they are batting .260, good for 10th in the league while putting together a .248 average at home. The Dodgers hold a .396 team slugging percentage and an on-base percentage of .322 which is good for 15th in baseball. They rank 12th in baseball with 8.73 hits per contest. Adrian Gonzalez comes into this matchup batting .268 and he has an OBP of .350. He has 62 hits this year along with 23 runs scored and 31 RBI. He's struck out 55 times and has walked on 29 occasions. 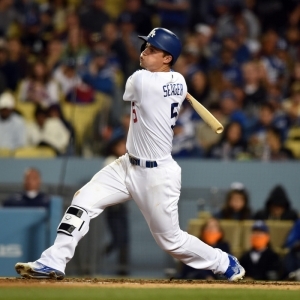 Corey Seager is hitting .275 and he has an OBP of .337. He has collected 71 hits so far while he's scored 42 runs and drove in 36. He has earned a walk 24 times and has punched out 50 times. The Dodgers as a unit have 522 base hits, including 95 doubles and 72 homers. They have 21 stolen bases while they've been thrown out 12 times. Los Angeles as a team has walked 228 times this year and they have struck out 522 times. They've had 446 men left on base and have an OPS of .683. They score 4.13 runs per game and have totaled 277 runs so far this season.